CRISIS IS AN ON-LINE MAGAZINE THAT BASICALLY FEATURES THE ARTS IN SOME FORM. IT APPROACHES SUBJECTS FROM A CHRISTIAN PERSPECTVE BUT DOES CARRY ARTICLES BY A VARIETY OF PEOPLE. FROM TIME TO TIME ARTICLES MAY HAVE A SOCIAL AND POLITIAL DIMENSION. MATERIAL IS WELCOMED, BUT THERE IS NO PAYMENT MADE. THIS MAGAZINE RUNS AT TONY JASPER’S LOSS. ADVERTISING IS NOT TURNED AWAY, AND AS WITH PROJECTED FEATURES IT MAY BE BEST TO EMAIL FIRST. SHOULD PAID MATERIAL BE FORTHCOMING THEN AS APPROPRIATE MONIES WILL BE PAID. CRISIS IS PLEASED TO WELCOME IN THIS AND IN FUTURE ISSUES COPY THAT DEALS WITH THE WORK OF GARTH HEWITT. THIS MATERIAL IS SUPPLIED BY HIS FOUNDATION.TONY JASPER IS A SUPPORTER OF GARTH’S WORK. Dylan pops up expectedly and unexpectedly. His new album Shadows in the Night (Columbia .has been winning over the critics. No gospel though. This is Dylan ‘kind-of ‘,singing through some of the great American standard songs. The guy has a ruined voice, but and but – he wins! So to he occasionally wanders off key, yet it matters not. Dylan exudes such a mesmerising charm that you ride along with whatever comes off the grooves. Naturally in-common with another half-singer Leonard Cohen the song arrangements and musical colouring are both cool, and so understanding, let alone under-stated..
Those two can afford the best. And, of course, on this album you have songs for any singer to die for. It’s simply an enjoyable album, rather good a listen late in the evening, and indeed who would have thought he would produce this kind of thing, but he seems to enjoy flouting the expected – remember his thirty fourth studio album of the time, or, if you like his 47th album, Christmas in the Heart (Columbia)? You could array a list of negatives for that release, but like Shadows in the Night just play it a few times and the unexpected delivers. Should you want Dylan gospel then it’s the unexpected to which attention is directed. Admittedly Pops Staples and the family unit The Staple Singers were among the first outside of the folk scene of the time to cull some gems from the early Dylan song catalogue way back to the 1960s. Dylan’s ‘Gotta Serve Somebody’ finds its way on to the new (and last) album from Pops Staples that is entitled, Don’t Lose This. (Anti). 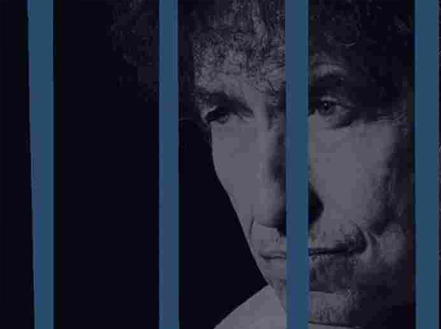 The Dylan version - his gospel hit of 1979 – is on his album The Collection and the studio set, Slow Train Coming, the latter with its overtly Christian expression. How the secularist Dylan fans hated that recording moment! They said Dylan had no right so speak and sing about Jesus, and at the same time they conveniently forgot Dylan had long explored Old Testament themes. Pop Staples is more associated with his family outfit The Staple singers with daughters Cleotha, Mavis and Yvonne, and before his early death, son Pervis.. They began solidly gospel and then took gospel into the US mainstream with influences from general R&B and soul, before returning to their gospel roots and the blues tradition they know so well. ~The great jazz man Duke Ellington said Pops played “gospel in a blues key.” It was a Pop Staples gospel composition that the Rolling Stones took and made into a hit – namely The Last Time, a success for the British outfit in 1965, and just one of numerous gospel tinged songs Jagger and his men have recorded. The family singers found a place in the freedom movement. There is a story behind the chosen title of Pop’s album Don’t Lose This. Pops died in 1985. These tracks have been lying around from the time when it was work in progress. Recordings go back to October 1998 at Chicago’s Hinge Recording Studio,. The release of these tracks, left somewhat rough and ready, and now given some up-to-date studio work, have finally made it after daughter, the now renowned wondrous solo artist, Mavis took the tapes to her recording producer Jeff Tweedy. As might be expected from anything involved with Tweedy everything emerges with a sparse feel without taking away emotion and immediacy. You get a lean mean feel, everything tightly focussed, minimal instrumentation, and so letting the vocalist be heard, and in this case it almost sounds as though the veteran singer is in the same room. The latter, “Better Home”, as has been said elsewhere, sees Pop’s voice take on a bluesy twang redolent of the Dockery Farm plantation in Mississippi where he grew up. ‘This is a gospel-country song that first finds its use by the family on their 1962 album This Land. The penultimate song Will The Circle Be Unbroken is a favourite Christian hymn in the bluesy-gospel world of the US and has been much recorded, and even here, in the UK, on an early Pentangle album Reflection in 1971. So to you can find the song in The Alexander songbook and other more gospel tinged collections, and a favourite in the folk scene. The lyric joins together heaven and earth and suggests we are never separated from those we have loved here. It has the line “By and by, Lord, by and bye. There’s a better home – a-waiting in the sky, Lord, in the sky.” Apparently it was the first song taught by Pops to his daughters. It can be located on their album Freedom Highway. And at the end of this powerful album there comes , the Dylan song, almost as though the wish is to end with a gospel message. You can find a previous version by Pops on the Father, Father, Grammy Award album of 1994. Unless there is other unrecorded material lying around, or waiting to be found on dusty shelves, this signals the end of a sixty-five year run for The Staple Singers. The older sister Cleotha died in 2013 at the age of seventy-eight after a long illness. 1939 born Mavis, of course, has been flourishing late in her life under Jeff Tweedy’s inspired producing, with superb albums that have drawn high praise from NME to Mojo and beyond. Just hear her studio album ‘You Are Not Alone’ for starters, both majestic and powerful then move on to the album One True Vine. This feature first appeared in The Methodist Recorder. I confess that when I go somewhere different I rarely seek out museums and the like. I look for a record shop, and ideally one that has lots of back catalogue, and stocks the more unusual. 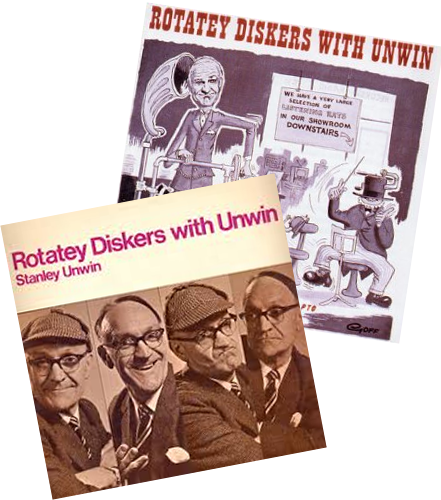 Trawling through a COMEDY section I came across ROTATEY DISKERS WITH UNWIN. Unwin was around decades ago but he was to say the least different, Here was a man who didn’t even speak English, even if the words came from the English dictionary – well, many of them. He could also say a sentence back to front! A Gemini, Unwin used his popular double-talk to great effect.